Carfax No Damage Reported. Carfax No Accidents Reported. Tire Specific Low Tire Pressure Warning, Side Impact Beams, Rear Child Safety Locks, ParkView back-up camera, Outboard Front Lap And Shoulder Safety Belts -inc: Rear Center 3 Point, Height Adjusters and Pretensioners. QUICK ORDER PACKAGE 24B -inc: Engine: 3.6L V6 24V VVT UPG I w/ESS, Transmission: 8-Speed Automatic (850RE), TIRES: 245/75R17 ALL SEASON (STD), SIRIUSXM SATELLITE RADIO -inc: For More Info, Call 800-643-2112, 1-Yr SiriusXM Radio Service, QUICK ORDER PACKAGE 24B -inc: Engine: 3.6L V6 24V VVT UPG I w/ESS, Transmission: 8-Speed Automatic (850RE), GVWR: 5,300 LBS (STD), GRANITE CRYSTAL METALLIC CLEARCOAT, ENGINE: 3.6L V6 24V VVT UPG I W/ESS (STD), BLACK, CLOTH LOW-BACK BUCKET SEATS, 21.5 GALLON FUEL TANK, Wheels: 17" x 7.5" Black Steel Styled. 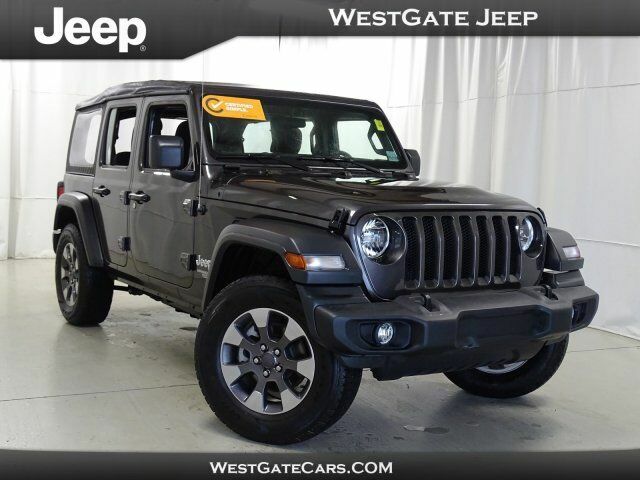 A short visit to Westgate Chrysler Jeep Dodge Ram located at 6421 Old Westgate Rd, Raleigh, NC 27617 can get you a dependable Wrangler Unlimited today!